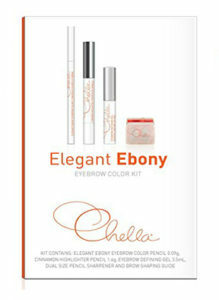 KIT CONTAINS: CHELLA EYEBROW CONDITIONING TREATMENT 3mL / 0.1 fl. 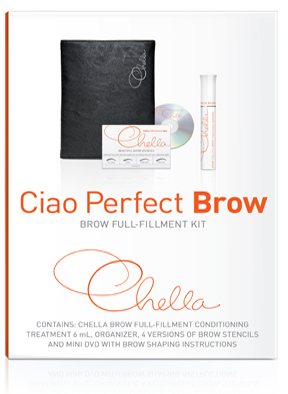 oz., CHELLA ORGANIZER, BEAUTIFUL EYEBROW STENCILS AND HOW TO BROW IN 3 EASY STEPS. CIAO PERFECT BROW. REALIZE YOUR DREAMS OF FULLER, HEALTHIER LOOKING AND MORE FASHIONABLE EYEBROWS. OUR COMPLETE EYEBROW KIT PROVIDES THE STENCILS TO SHAPE AND DEFINE PLUS OUR EYEBROW CONDITIONING TREATMENT FOR SENSATIONAL EYEBROWS. CHOOSE YOUR DESIRED LOOK AND USE THE ENCLOSED EYEBROW CONDITIONING TREATMENT AND STENCILS TO MAKE IT A REALITY. POLISHED, SOPHISTICATED EYEBROWS. THAT’S BEAUTIFUL! THIS TRI-FOLD, MAGNETICALLY CLOSED ORGANIZER HAS 8 SPACES FOR ALL YOUR BROW SHAPING TOOLS AND EYEBROW PENCILS OR CREAMS, KEEPING YOUR BEAUTY REGIMEN AS NEAT AND BEAUTIFUL AS YOUR CHELLA BROWS. TO HELP GUIDE YOU IN CREATING THE PERFECT BROW, PICK ONE OF OUR FOUR STENCILS TO ACHIEVE YOUR DESIRED LOOK AND AS A GUIDELINE FOR APPLYING THE CHELLA EYEBROW CONDITIONING TREATMENT. © Copyright 2017 — U Neek Spa brands.